Imaging revealed red colors, indicating higher skin blood flow, in the massaged area. Credit: Tokyo Institute of Technology. Facial massage rollers are commonly used for beauty care, however their effects on skin blood flow and vascular reactivity remain unclear. Thus Scientists at the Tokyo Institute of Technology, Japan, examined the impact of face massage rollers on the skin. The study was published in Complementary Therapies in Medicine. In the first experiment, the scientists measured the facial skin blood flow change following a 5-minute massage roller application to the right cheek in 12 participants. The study visualized the change in blood flow using a non-invasive technique called laser speckle flowgraphy. 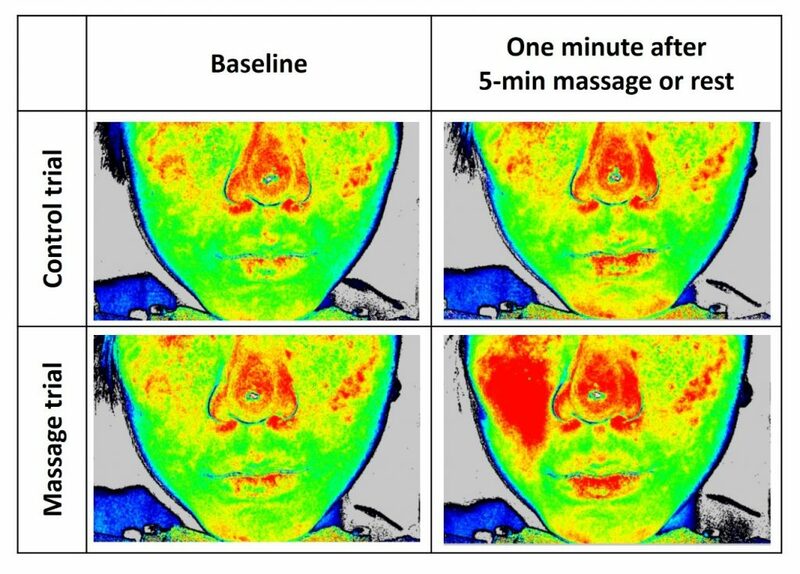 Results showed that a 5-minute massage significantly increased facial skin blood flow solely in the massaged (right) cheek for at least 10 minutes after the massage. In the second experiment, the researchers assessed the effect of a 5-week daily use of facial massage roller on the skin blood flow in the right cheek. They also examined the reactivity of facial blood vessels to a heat stimulus, involving application of a heating probe set at 40°C, to test whether there were any changes in vascular dilation response. The 5-week intervention significantly increased the vasodilatation response to the heat stimulation solely in the right cheek. A possible explanation is that endothelial cells in the massaged area produce more nitric oxide, which is known to be an important vasodilator. The authors suggested that performing short-term facial massage with a roller increases skin blood flow, and long-term use improves the vascular dilatation response. Regarding the result regarding increased blood flow to the skin following roller massage, I feel the way I often feel after reading this type of study. We prove something that should effectively already be understood to be true based on our understanding of the fundamental mechanics of the underlying anatomy and physiology. Blood flow is based essentially on two things. Most people think only of the heart pumping blood into the circulatory system. But the heart only pumps halfway through the “circle” of the circulatory system. The circulation in the other half of the circle is the venous flow that is based on mechanical pressure. Venous circulation is often described as the “muscular pump” because the usual mechanical force that moves the venous blood comes from muscular contractions that cause pressure against the walls of the veins. But mechanical force is mechanical force, so it stands to reason that manual massage or roller massage would similarly create these mechanical forces that would move fluid through the veins. And if we improve/increase venous circulation, we improve/increase arterial circulation. Of course, it is nice to have this increased blood flow effect quantified. With an increase of up to 25%, this study should help to justify the beneficial effects of fascial massage for the health of the skin. Did you know that Digital COMT (Digital Clinical Orthopedic Manual Therapy), Dr. Joe Muscolino’s continuing education video streaming subscription service for massage therapists (and all manual therapists and movement professionals), has at present (December of 2018) more than 1,000 video lessons on manual therapy continuing education, including entire folders on massage therapy, stretching, and joint mobilization. And we add seven (7) new videos lessons each and every week! And nothing ever goes away. There are also folders on Pathomechanics and Anatomy and Physiology, including an entire folder on Cadaver Anatomy… and many, many more on other manual and movement therapy assessment and treatment techniques? Click here for more information.